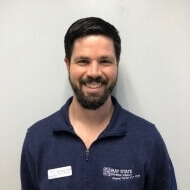 Steve graduated from Northern Arizona University in beautiful Flagstaff, Arizona with his Doctor of Physical Therapy. He enjoys treating a broad range of orthopedic and neurological conditions. An avid road and trail runner, his special interests include gait analysis as well as strength and conditioning for endurance athletes. When not in the clinic, Steve can usually be found running along river paths or any of Massachusetts numerous mountain trails. He is a military brat, and has lived in many different locations including Japan, Las Vegas, and Germany to name a few.